As a Reiki Master & Practitioner in both Usui Shiki Ryoho Reiki & Angel Reiki I offer Angel Reiki Practitioner Training Courses in Levels I & II as well as Levels III/IV (Master Practitioner & Teacher Levels). Not only will this enhance your healing abilities but it will create a strong link to the Angelic Realms. What Is Angel Reiki: Angel Reiki is a very powerful process of healing where the actual control of the process is given over to the angels by the practitioner, with the practitioner being the channel for the angelic realms. During a session the client is subject to both a process of healing & of empowerment touching mind, body & soul as well as the mind of the recipient. The most powerful aspect of Angel Reiki is that the healing comes through the wisdom that is shared by the angelic kingdom. Having said how powerful Angel healing is, it is also incredibly gentle for the recipient. How Does Angel Reiki Differ From Usui Reiki: Angel Reiki, as a process, is very different from that of traditional Usui Reiki in the sense that the healer has a lot bigger role to play in the later, actually facilitating the healing. In angel Reiki however, the healer’s role is more minimal, all is required of them is for them to hold the role of a channel to create the portal for the Angelic Realm and maintain it during the healing process. It can be very difficult for a healer to sit through the process because they have no hand movements to co-ordinate, nor do they have to perform any oral chanting. There is basically no process to follow which can be quite disconcerting for a traditional Reiki Practitioner. The angelic energy that is received in a treatment will be tailored to the requirements of the recipient and the nature of the ailment requiring healing. This means that the energy that is received is different for different people with different needs. The healing energy coming through the Angel Reiki Practitioner is straight from the Galactic Healers, Ascended Masters plus the angels from the Angelic Dominions, there is unlimited, loving energy source available. The healer’s personal intentions, thoughts & feelings do not interfere with the healing process, this means the energy being received by the recipient is pure. Who Can Learn Angel Reiki: Despite the fact that Angel Reiki is a powerful healing process, it lacks the complexity of other Reiki styles, there is no chanting, no elaborate symbols to draw, few rules and no hand movements. 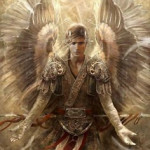 There is little theory with Angel Reiki with it being more about the practical aspects. The minimum age of students should be 14 and above so they are able to grasp the concepts of Angel Reiki & the Angelic Realms, Galactic Healers, Ascended Masters etc. If you have the wrong notion about Reiki & Angel Reiki it will mean that much hard work will be required to get that incorrect knowledge out of your system. Angel Reiki is pure and it requires nothing but a pure heart and an open mind that is eager to connect with the Angels and the all-encompassing life energy that engulfs the Universe. The History of Angel Reiki: Angel Reiki predates Usui Reiki which was actually ‘rediscovered’ by Mikao Usui in the 1800’s. Angel Reiki was given to us by the Angels during Lemurian times and was also practiced in Atlantean times, it was sadly lost when Atlantis was destroyed. Angel Reiki harnesses the pure energy that emanates from the Angelic Kingdom down to us on Earth in the form of vibrations that cures ailments, heals conditions and brings about a change in human lives that is unprecedented and as often as it seems, miraculous. During this 2-day workshop students can expect to build on their existing knowledge as they master more advanced skills as well as learning how to Attune future students and master all the teaching skills required for life as a Master Practitioner/Teacher. It is a heavily practical course and so the more experience the better is recommended before taking the course so that as much as possible can be taken from it. Attendees should have a couple of years of case studies and clients at the fingertips so they can master the new skillset. If you are unsure whether you are ready please contact me to discuss.